This one takes a little bit of preplanning because you have to cook the pork ahead of time, but it is so worth the extra effort! These nachos are unique and flavorful. To cook the pork, put some water in the slow cooker, just enough to cover the bottom. Cook the pork on high for 5 to 6 hours. Shred the pork using two forks to separate the meat. Add the sliced onions and the BBQ sauce to the shredded pork and continue to cook for 30 more minutes. 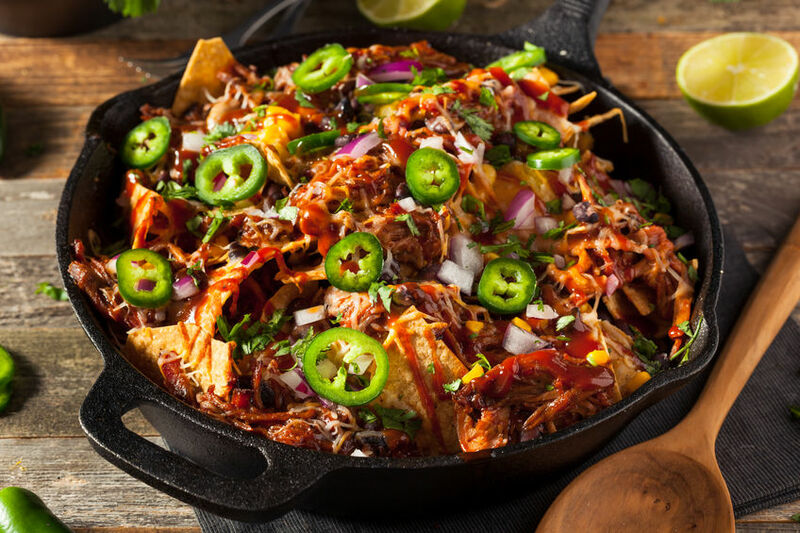 You can cook the pork at any time and refrigerate it if necessary until you are ready to make the nachos. To make the nachos, line a baking sheet with tin foil and spread the chips onto the tray. Place the BBQ pulled pork on top, along with your desired amount of pickled jalapeno slices. Heat up the nachos in the oven at 350 until the pork is warmed up, about 10-15 mins. Heat up the Gordo’s Cheese Dip as directed and drizzle over the nachos once you take them out of the oven. Serve with sour cream on the side. It’s a perfect combination!